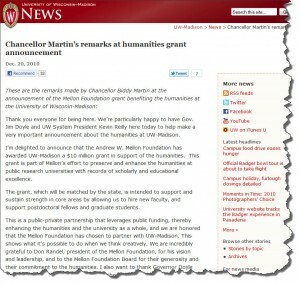 Major Infusion of Funds for Humanities at University of Wisconsin, Madison. The University of Wisconsin, Madison, announced on December 20, 2010, that it has received $10 million from the Andrew W. Mellon Foundation—matched by another $10 million from the state of Wisconsin—to support the humanities by sustaining strength in core areas, hiring new faculty, and supporting postdoctoral and graduate students. The French-Algerian poet, Helene Cixous, once said, in a talk she gave here in Madison, Wisconsin, that the inability to read a poem puts us at risk of not being able to read the newspaper. I don’t know whether that’s literally true, but I agree with the underlying premise. The ability to read and think critically, to handle complexity, and to express ourselves effectively are critical to our freedom and our prosperity. Unfortunately, some people have come to see the humanities as a luxury. I cannot think of a more dangerous assumption. Some understand the importance of education in the humanities, but do not see the significance of research. Let me put its importance in simple terms. Think of it this way — what if you, as an individual, had no memory? No record of your own history. What if your use of language were not pliable, expressive, creative? Think about a society without memory, without a sense of its history, without the ability to use language and other means of expression and communication. Now imagine that you have only memory and can do nothing more than mimic the past, robotically, or that you have no capacity for reflection or analysis, and no tools for developing your individuality. What about a society or societies of people who cannot think for themselves, transform their experiences and cultural heritage, or imagine more than they have already seen. Where do the tools for preserving, enhancing and reinventing language and culture come from? They come from scholarship and education in the humanities—in literature, art, music, anthropology, film, TV studies, studies of social media, studies of language and of language use, creative writing, history, interdisciplinary collaborations among humanists, social scientists and scientists.